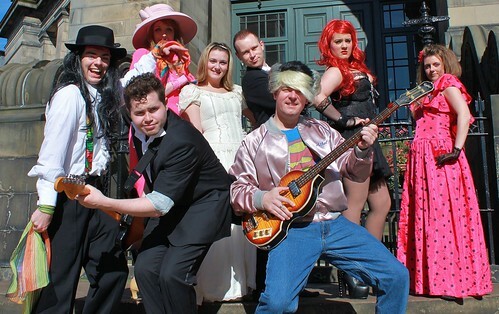 It’s 1985 and rock-star wannabe Robbie Hart is New Jersey’s favourite wedding singer. He’s the life of the party, until his own fiancee leaves him at the altar. Shot through the heart, Robbie makes every wedding as disastrous as his own. 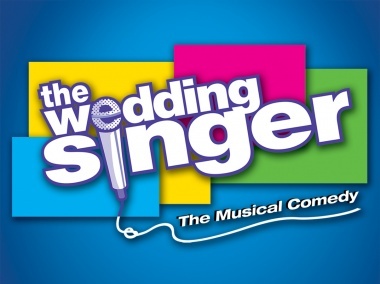 Packed with bounce and swaggering with confidence, Allegro’s production of the Wedding Singer is a hearty – and slightly unexpected – treat up at the Church Hill Theatre all week. Based on the 1998 film of the same name, it stars Fraser Jamieson as Robbie Hart, the wedding singer of the title, whose cheesy patter and down home lyrics make all his weddings go with a fizz. Until his own wedding that is. When his fiancé of seven years, the gorgeous, pouting and totally obnoxious Linda (Mairi Beaver) ditches him at the alter. By letter. And in the ensuing heartbreak the poor lad becomes incapable of performing at a betrothal without breaking into vitriolic attacks on love and all who are in it. It’s not Checkhov, but it has the same predictability. If someone catches a wedding bouquet in the opening scene, you can be pretty certain that they will be wielding their own come the finale. Particularly if, like Jennifer Good’s delightful waitress Julia, they happen to be in love with a totally inappropriate dork, such as Steven Park’s oily Glen Guglia. And while the 1985 setting might prompt a particularly outrageous attack of fashion no-nos, the company don’t overplay them. Even if the wig department has been working overtime procuring the most preposterous rugs for the male members of the company. Add a strong sense of storytelling from director Janice Bruce; some slick choreography from Caroline Howie; and very strong musical presence in the pit guided by MDs Simon Hanson and James McCutcheon, and you have a recipe for a bright and vibrant production. Musically, this plays to its strengths. Jamieson’s cheeky, personable stage presence is exactly right in the title role. Add his ability to hold all the tunes – from the delicate to the mocking and the raucous – while strumming a guitar too, ensures that this is already flying from the start. In the wedding band, Paul Inglis is suitably unreconstructed as bass player Sammy, ex-boyfriend of Julia’s cousin and fellow waitress, Holly. Their off-off bickering is nicely played, with Nicole Graham as Holly really stepping up to the mark for their big number, Right in Front of Your Eyes. She certainly knows how to sell a number. 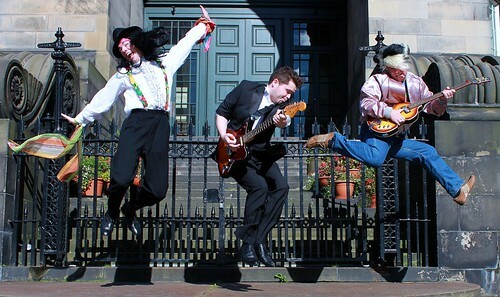 Blair Grandison plays up the role of band’s keyboard player, a camp Boy George wannabe called George – as a musical this is nothing if it is not obvious. Helen Goldie puts in a sprightly turn as Robbie’s granny, Rosie, who lets him live in her basement. Judith Neeson is scarily real as Julia’s mum, Angie, who sees the dollar signs clicking through in Glen. Any half-decent musical need a great baddie and Park does a proper job in creating the got-rich-quick Wall Street banker, Glen. As Julia’s inappropriate fiancé he oozes smarm while he carries the obvious Eighties jokes well – huge mobile phones are not the half of it. And when called upon to deliver a number he pulls off a splendidly tight dance routine in All About the Green. Mairi Beaver displays a wonderful singing voice as Linda, laying into her numbers with an easy, laid-back feel which belies a strong and quite precise attention to detail. Which isn’t quite carried over into her acting performance. Let Me Come Home, her semi-clad, predatory attack on the drunken Robbie is certainly a highlight, but it is more about a teasing, audience-aware performance than telling the story through her character. This is a company which is lucky enough to have strength in depth. Even where the quality of performance is not quite as even as it might be, the individual chorus members never look as if they are shirking. It’s particularly impressive in the big chorus numbers where choreographer Howie takes them right to the edge of their comfort zones, with enviable results. That, and the way the ensemble numbers keep the plot bubbling along. Even the simple establishing wedding is well thought through. But by the time Robbie destroys another wedding in Casualty of Love – culminating in a full on fight as the bride understandably decks him one – it has moved up into top gear. As for the New York night club-set Saturday Night in the City, that gives everyone free reign to dream up their worst fashion excesses. Fluorescent fishnets over black leggings anyone? Oh yes, those happened. A thoroughly enjoyable production from Allegro – which quite possibly does more for the original musical than it deserves.